Most summers I tend to obsess over one specific salad. A salad that circulates through pot-lucks, bbq’s or just dinner at home. Last summer I made this Quinoa Lentil Salad many, many times. The previous summer, my garden was bursting with vegetables, which inspired this Summer Squash Salad with Feta and Herbs. 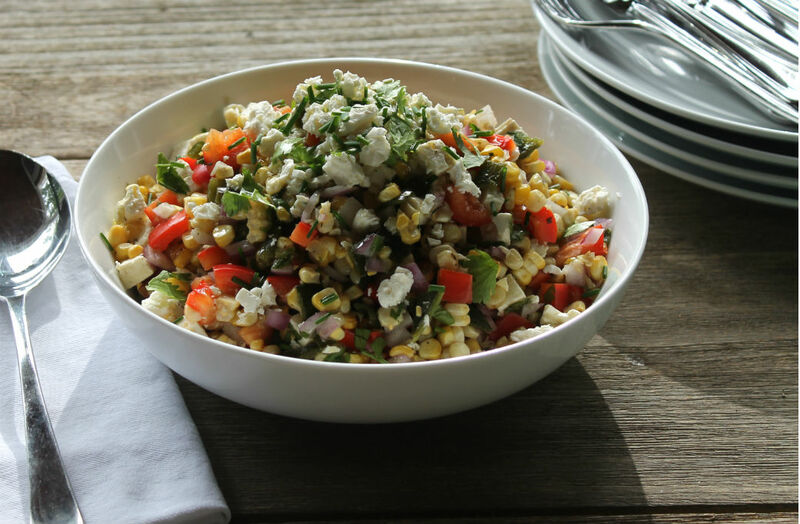 This year a bright and festive corn salad has popped into our repertoire. Laden with charred smokey poblano peppers, red-bell pepper, feta, red onion, and a lots of fresh herbs. This salad is so simple – with easy to find ingredients, it also tastes great at room temperature and pairs with just about anything, that’s a winner of a salad in my book honey. I am thinking of a charred poblano and potato salad next, what do you think? Place shucked corn and poblano peppers on a sheet pan and drizzle with olive oil, salt and pepper and cumin. BBQ on medium high heat rotating until softened a bit and charred slightly. Or place sheet pan under broiler and broil 3-5 mins per side until slightly charred in spots. Set aside to cool. Once cooled cut each cob in half then place cut side down on cutting board and cut off kernels. Peel outer thin skin from poblanos and cut in half, remove seeds and ribs from inside then cut into a small dice. In a large bowl add corn, poblano peppers, chopped red pepper, onion, lemon zest and juice, 1/2 of the herbs, salt and pepper to taste and toss well. Top with crumbled feta and remaining herbs and serve. Oh, my gosh….this looks amazing!